About 9 months ago, I started eating healthy. My entire life, I indulged in sweets, salty snacks, MacDonald’s; you name it. After getting sick and tired of feeling crappy all the time, I thought that it would be best to attempt to eat healthy for one month. But, what started out as New Year’s Resolution, turned into a huge part of my daily life. Although eating healthy comes naturally to me now, it certainly wasn’t easy in the beginning. My biggest struggle was giving up Coca Cola. As many know, soda is high in sugar, and large amounts of sugar was something that I was trying to avoid. So, I thought that I would turn to diet soda. When I asked my dad about switching to diet coke, he shut down the idea immediately. He told me that I should try drinking as much water as I can, and that diet soda is nearly just as bad as regular soda. Although I listened to him and drank mostly water, I still come to think: If there’s not sugar in diet soda, then why is it so bad? After doing research on diet soda, I found that there are many reasons as to why it’s still threatening to one’s health. According to medicaldaily.com, the consumption of diet soda can result in weight gain, due to the body’s craving for real sugar. The body doesn’t crave the artificial sugar, therefore it is not satisfied. So, this could lead to the overconsumption of food and drink, due to the bodies dissatisfaction with the artificial sugar. Not only can people gain weight, but there is a connection to heart disease and soda. As I read on clark.com, there was study conducted on 42,400 men in Sweden. They all drank at least two artificially sweetened drinks a day, for 12 years. After 12 years, the scientists found that there was a correlation between the two. In fact, 3,064 had a positive correlation with risk of heart failure and artificially sugary beverages. And shockingly, 509 of the men died of heart failure. As I was doing research on diet sodas, I found that a chemical called aspartame is a substitute for sugar in many of there diet soda products. There has been a debate on whether or not this chemical is a cancer causing agent, but in 2012, a Harvard study found a link in an old study that was conducted. About 120,000 participants drank at least one diet soda a day, ⅔ of them being women and ⅓ of them being men in a study by the Nurse’s Health Society. The researchers found that men and women were more likely to get leukemia by drinking one soda a day. The mechanism for this was not founded, but the connection was there. Click here to read more about this study. 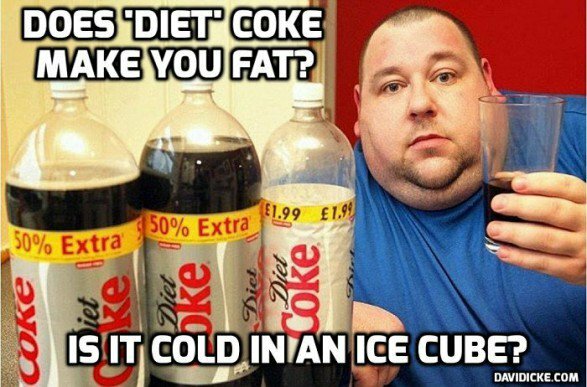 Overall, I think that it would be safe to say that diet coke certainly doesn’t do anyone any good. It can cause weight gain, and people could end up with serious health issues, including heart failure and possibly cancer. I had this same issue. I used to love soda and would get one whenever I went out to dinner or saw a vending machine. Switching away from it was hard. I found out the drinking sparkling water and sometimes putting a lemon or lime in it to give it flavor was a great solution. I realized that when I stopped drinking soda, I missed the bubbly feeling in my drinks. Sparkling water has the bubbles and is literally just water so it isn’t bad for you! This is a topic I have always been confused about. There is no sugar and no calories, which are the two things I ever think about when it comes to eating healthy. After reading this article it makes more sense why drinking diet soda could be detrimental since it is flavored all artificially. 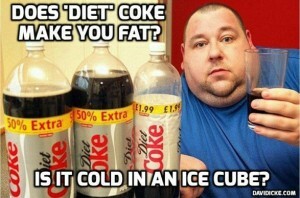 http://www.health.com/health/gallery/0,,20739512,00.html This article goes into more detail as to why diet soda is bad for you.